LONDON--(BUSINESS WIRE)--Nov. 26, 2018-- LivaNova PLC (NASDAQ:LIVN), a market-leading medical technology company, today announced it has joined forces with actor and epilepsy advocate Greg Grunberg. 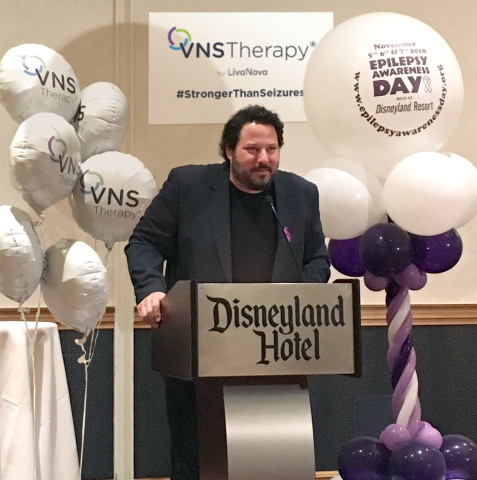 The partnership kicked off at the Epilepsy Awareness Day at Disneyland Education Expo, where Grunberg joined LivaNova to raise awareness of seizures, drug-resistant epilepsy (DRE) and the available treatment options. Grunberg’s inspiration to speak out about epilepsy comes from his 22-year-old son, Jake, who has epilepsy that is now under control. Finding relief from seizures wasn’t always easy for Jake, who was first diagnosed at age 7. Jake has DRE, which affects one in three people with seizures, and medication alone did not provide adequate seizure control. Jake’s seizures progressively became worse as he grew older. By age 12, he was having hundreds of seizures per day. Today, Jake is a thriving young adult. His seizures are controlled thanks to his medication, Vagus Nerve Stimulation Therapy® (VNS Therapy), brain surgery, and a combination of lifestyle modifications and treatments. VNS Therapy—a medical device designed to prevent seizures before they start and stop them if they do—has been a constant Jake has relied on for more than 10 years. Since Jake’s diagnosis more than 15 years ago, Grunberg has become one of the most prominent and active advocates within the epilepsy community. He has partnered with the Epilepsy Foundation to dispel the stigma and lingering myths about epilepsy, and to encourage people to speak more openly about the condition. An actor, writer, producer and epilepsy advocate, Grunberg has appeared in numerous feature films, including “Star Wars: The Force Awakens,” “Star Trek Beyond” and, most recently, “A Star is Born,” featuring Bradley Cooper and Lady Gaga. On TV, he is best known for his roles in the HBO film “Paterno” and hit series such as “Heroes,” “Alias” and “Felicity.” He also started Band From TV, an all-celebrity cover band that donates the majority of its earnings to charitable causes. As the band’s drummer, Grunberg donates his portion to the Epilepsy Foundation. He lives outside Los Angeles, where he enjoys spending time with his wife Elizabeth and their three sons. Greg Grunberg is compensated for his time as an advocate for VNS Therapy. An estimated 3.4 million Americans are living with epilepsy, which is the fourth most common neurological disorder–behind migraine, stroke and Alzheimer’s disease. While medication is the first line of treatment for seizures, about one-third of all epilepsy patients have drug-resistant epilepsy–or seizures that continue despite trying multiple antiepileptic drugs. After the first two drugs have failed, there is roughly a 5 percent chance that adding more medication will result in seizure freedom. Despite this, most patients will continue to be prescribed additional medications instead of being evaluated for non-drug therapy options. VNS Therapy is clinically proven safe and effective for the treatment of drug-resistant epilepsy for adults and children 4 years of age and older. VNS Therapy is designed to prevent seizures before they occur and stop them if they do. It is a unique treatment approach developed for people with drug-resistant epilepsy—a condition that affects one in three people with epilepsy. For more information, visit VNSTherapy.com. Epilepsy—The VNS Therapy System is indicated for use as an adjunctive therapy in reducing the frequency of seizures in patients 4 years of age and older with partial onset seizures that are refractory to antiepileptic medications. Commonly reported side effects are hoarseness, shortness of breath, sore throat and coughing. Side effects typically occur during stimulation and decrease over time. See safety information at VNSTherapy.com/safety. Manufactured by LivaNova USA. To contact, visit VNSTherapy.com or call 1-888-867-7846. ©2018 LivaNova USA, Inc, a wholly-owned subsidiary of LivaNova PLC. All rights reserved. LivaNova®, SenTiva®, AspireSR® and VNS Therapy® are registered trademarks of LivaNova USA, Inc.
For more information, please visit livanova.com.